Continuing the Shadows of Mirkwood saga, The Dead Marshes adventure pack is the fifth in the cycle, and finds the heroes trying to corner and capture the creature Gollum in the treacherous mires, before he escapes for good. It has a difficulty rating of 5, putting it roughly in the middle of all of the scenarios thus far in the series. For this adventure the developers have again devised a new mechanic: the escape test. 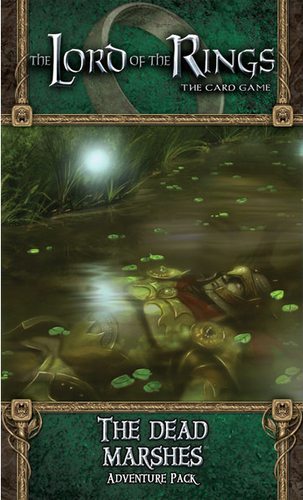 At the start of the game, the Gollum card is placed in the staging area, and at various times (including the end of each round) the players are required to pass a test, similar to the standard questing: if they pass, nothing happens, should they fail, some tokens get placed on Gollum (and depending on situation, their threat level might rise). Enough tokens on Gollum, and he disappears into the deck. Whilst this is thematically quite pleasing, the challenge being to prevent Gollum from escaping your clutches, there are enough of these tests in the game to make it fairly likely that Gollum will disappear. Which makes the rest of the game a potentially very long slog to try to find the card again, and doesn’t preclude the card appearing only to be discarded again (for example as a shadow card). In one of our games we managed to cycle through the full deck three or four times, and still didn’t get a chance to complete the mission before losing to a high threat value. Some players consider this a thematically very fitting mechanic and far more exciting than the variations included in The Hills of Emyn Muil or even A Journey to Rhosgobel. Perhaps I’ve just been unlucky, but I found this scenario simply dull. There is only one new enemy in the set, although some of the larger ones from the core game reappear (Wilderlands encounter set), which at least give your characters something to do once you’ve lost Gollum. The expansion probably gets harder the more players are present, at least in as far as some of the Treachery cards require each player to perform an escape test, although this would also allow the deck to be cycled much quicker and might make losing Gollum less of a fiasco. The player cards in this pack are similar to what we’ve come to expect from the previous ones. The hero here is Boromir for the Tactics sphere, whose dual abilities allow him to ready himself at any time for an increase in threat, as well as go down in a blaze of glory, dealing damage to all enemies engaging one player before being discarded. Definitely a worthwhile hero, with a second ability that is quite situational, but could at the same time be a life saver. Apart from that, Tactics gains another eagle ally, and their song card; the Spirit sphere gains two more Rohan related cards; Leadership features an ally with a one-off chance to negate shadow card effects, and another stat-enhancing attachment, this time giving a hero the ‘ranged’ attribute; Lore have a Silvan ally useful for questing, and a hobbit attachment, probably the weakest card in this set. Overall, I found this to be the weakest adventure pack in the series, the solid player cards aside. Whilst I appreciate the new mechanic and enjoy the added variety, I felt that the scenario was very repetitive and potentially unbeatable should Gollum disappear, and this unduly dragging the game out to an eventual fizzle rather than an exciting climax. Of course, it may be possible to have a lucky turn of cards, but then the scenario would also likely finish in a few turns. You might not think that’s cricket, and it’s not, it’s motor racing.